For those of us living in the United States, Memorial Day is the unofficial start of summer. Warmer weather has arrived, the days are longer, the grandkids are out of school, the pools get uncovered, and cook-outs are the order of the day. And if you live on one of the coasts or near a lake, this also is probably the first foray to the local beach. It’s a time of the year that most of us look forward to since it means we get to spend more time outdoors, doing what we like, with the people we love. Sunburn, bug bites, blisters from ill-fitting shoes, heartburn from all the BBQ, and muscle aches and pains are all things that may ruin your summer fun. And while you likely have most of these covered, one thing you probably haven’t thought of that can quickly put you on the sidelines is dehydration. Dehydration happens when you lose more fluids than you take in and your body’s normal functions are impacted as a result. Many people underestimate the importance of being adequately hydrated, especially during the summer months. Generally, you drink water to stay hydrated. It is one of the critical nutrients you need to live and the only nutrient whose absence will cause death within days. Death is an extreme consequence of dehydration. The majority of us – up to 75 percent by some reports – are dehydrated to some extent, and we don’t even know it. Anyone can become dehydrated. But Boomers are more susceptible than younger adults given how our bodies change with age. It is also more dangerous for us as evidenced by the fact that dehydration is one of the most common causes of hospitalization for those of us over 65. One of the most common changes in our bodies that can contribute to dehydration is the simple fact that our sense of thirst tends to decline with age. This puts us at risk of missing the first warning sign that we need water. We also tend to have reduced kidney function which makes it harder for our body to respond and adapt to temperature changes. This is especially important in the summer when we often will go from the air conditioning to being out in the sun. Another way we are different from our children and grandchildren is that our bodies don’t hold as much water as they once did. This is primarily due to losing muscle and gaining fat. The change is also dramatic. For example, by the time we’re 80, our bodies have about 15 percent less water than we did when we were 20. This helps explain why it can take us longer to bounce back from being dehydrated and why even a small amount of fluid loss can impact us more than it once did. Last, but certainly not least, is that as boomers we probably take more medications now than we did when we were younger. Blood pressure medications, diuretics and laxatives can all cause us to lose more fluids than we are taking in. We also often take more than one medication at once, which can make it even easier for us to get dehydrated. Add in coffee and alcoholic beverages, both of which are diuretics, with increased perspiration during the summer and you have the perfect recipe for dehydration. 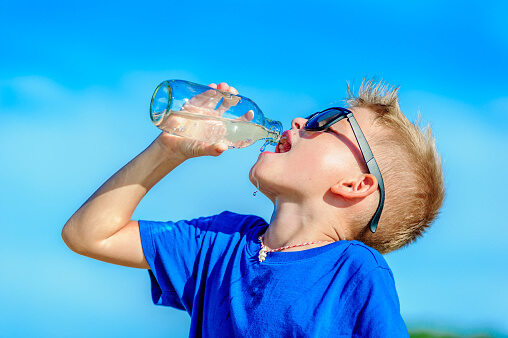 Since thirst, especially with boomers, isn’t always a good indicator of whether we are adequately hydrated, it’s important to increase our water intake during the warmer summer months – regardless of how thirsty we feel. If you wait until you have dark urine, dry skin, sunken eyes or dry mouth, the odds are you’re already dehydrated and perhaps dangerously so. But exactly how much water is enough? Well, believe it or not, as women we need about 9 cups a day. So, your mother’s advice to drink “eight glasses of water a day” is close to that recommendation. And keep in mind that this includes all fluids and not just water. This means that you don’t need to limit yourself to water to stay hydrated. One great option, especially during the summer, is coconut water, the clear liquid that comes from the inside of the coconut. This is not to be confused with coconut milk, which isn’t all that healthy given its fat and caloric content. In comparison, coconut water has only about 45 calories per cup, is low in sugar and rich in potassium. Also keep in mind you can get part of your daily water needs from some of the foods you eat. In the United States it is estimated that about 22% of water comes from our food. Water rich foods include cucumbers, which are about 95% water, and watermelon, which is about 90% water. Not only will you be helping yourself get your daily water needs, but you will also be getting critical vitamins and minerals your body needs to stay healthy. As a rule of thumb, fresh fruits and vegetables have a higher water content than most foods. Eating soups, preferably homemade – canned soups have a lot of added sodium – is also a great option for ‘eating’ your water. If you find yourself struggling to get your daily water needs, or maybe you just get sick of drinking plain old water, be innovative by adding fresh fruits to plain water. For example, adding sliced cucumber and lemon are great ways to make plain water taste delicious. What is your experience with dehydration? How did you deal with it? How much water do you usually drink every day? How do you remember to stay hydrated? Do you change your fluid intake during the summer? Please share your tips in the comments below!